As you can imagine, we’re a veritable bunch of bookworms here at The Reader Organisation and in any one week you’ll find that members of our staff are reading everything from Austen to Markus Zusak, Hardy to Kazuo Ishiguro. Here on The Reader Online we’re always keen to provide you with great reads that you might not thought to have picked up before, and who better to ask than our well-versed staff? 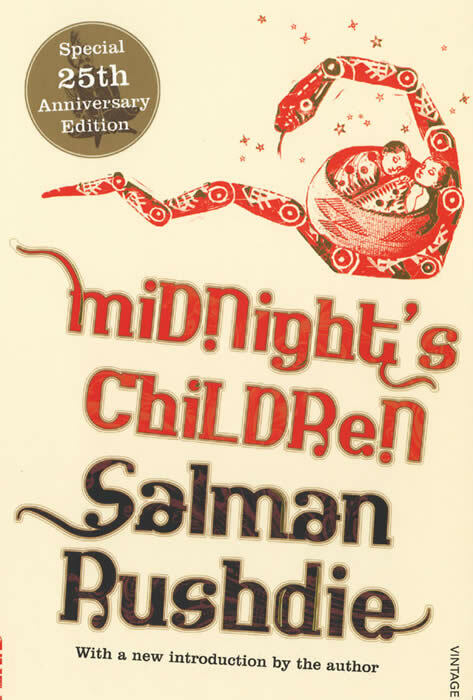 You can peruse our archive of Recommended Reads by clicking here, and our latest comes from Rebecca Pollard, our current Arts Administration Intern who has a passion for the modern classic Midnight’s Children by Salman Rushdie. It’s hard to describe Midnight’s Children without gushing about the colours, the emotions, the puns, the twists, the religions, the chutneys, the nose and knees, the knees and nose, or the bizarre, enchanting characters – but I’m going to try. Midnight’s Children was on the reading list for one of my university modules, and we were told to start reading it straight away (even though we were beginning seminars about the book two months later). A feeling of dread rose through my body: I’d heard of Salman Rushdie – he was an ‘important’ author, and this novel had won the Booker Prize, the Booker of Bookers, and the Best of the Booker. Reading this novel was going to be hell: it was going to be the most difficult novel in the history of fiction (especially as, at this point, I had never read anything that could be even be loosely described as ‘postcolonial’). It obviously wasn’t hell… it was brilliant. The novel itself is split into three books which are all narrated by the protagonist Saleem Sinai, who was born at the stroke of midnight on August 15th, 1947 – the moment India and Pakistan became independent nations. The first book focuses on Saleem’s family, and how Saleem came into being (because, after all, he states that he is the ‘the sum total of everything that went before me’). The second book follows Saleem’s childhood and his family’s relocation to Pakistan, and the third follows Saleem after he loses his memory and becomes ‘the Buddha’. As he gets older, Saleem discovers he has telepathic powers, which he associates with his large, constantly dripping nose. His telepathy allows him not only to hear the thoughts of people close to him, but to create a space for the 1,000 other children who were born between 12am and 1am on the same night, and who too have powers. His story becomes intertwined with India’s story – as India develops, Saleem develops, when India is in crisis, Saleem too is in crisis. Saleem’s narration might at first seem arduous and unnecessary, but his digressions and faulty memory are what makes the story absorbing, funny, and most of all human. It is through this warm narration that Rushdie is able to write about the harsh reality of India, Pakistan and Bangladesh during the 20th Century – the Indo-Pakistani wars, the State of Emergency, the bulldozing of the Jama Masjid slums, forced sterilization, and Bangladesh’s messy birth. What I mean to say is: read this book, and if you’ve read this book, read it again. Read it for the rich language and imagery, read it for the magic and excitement, read it for the political storylines. Just read it.